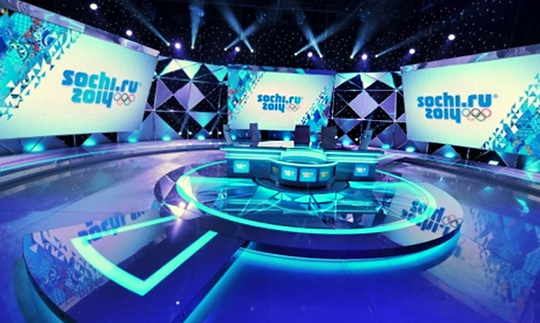 NBC has the largest studio setup in Sochi, with two complete environments. Read our complete view here. 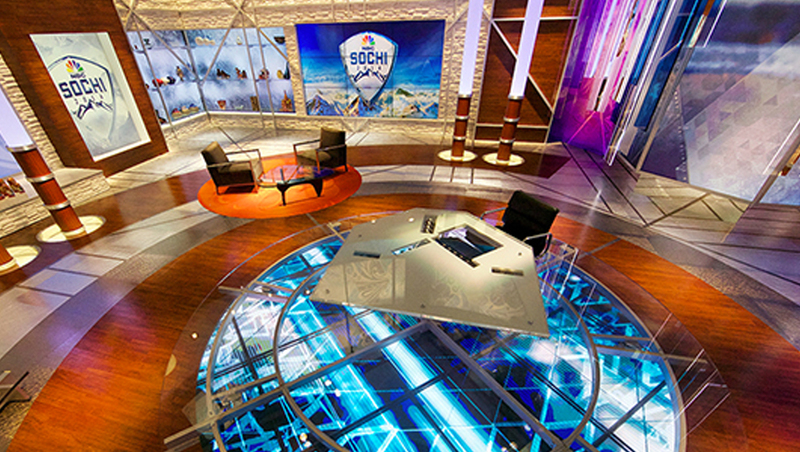 NBC’s studio was designed by Clickspring Design and fabricated by blackwalnut. 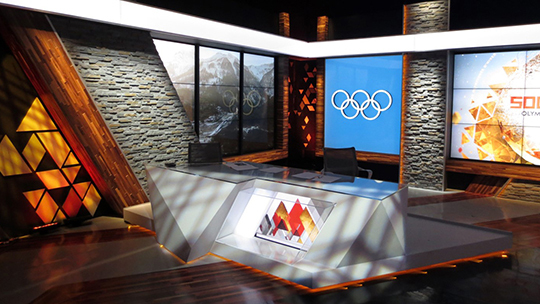 NBC’s graphics were designed by the NBC Sports Group and mix Russian patterns with a diagrid. CBC has the second largest footprint in the International Broadcast Centre with this studio by AKA Creative Group. The graphics package features gold and red triangles with polished 3D. Watch for a complete review of CBC’s coverage and more pictures from inside the studio. 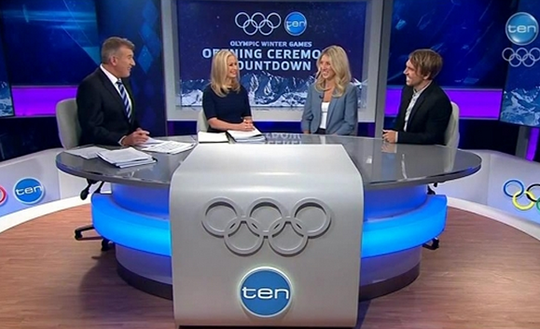 Australia’s Ten has three studios total, one in Sochi and two in Australia. They were all designed by Mark Dyson of Pitch Design with the graphics package designed by DD8. The graphics match the blue tones of the set and feature extruding diamonds with simple 3D mountains. 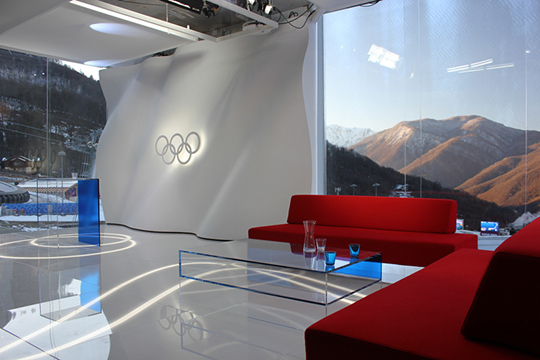 TV2 Norway brought a portal studio that will be used at future Olympics. Located in the mountains above Sochi, the studio has a stunning view with a minimal design. The studio was designed by Anders Tomren. Poland’s TVP is broadcasting from afar, in a spacious studio in Warsaw. 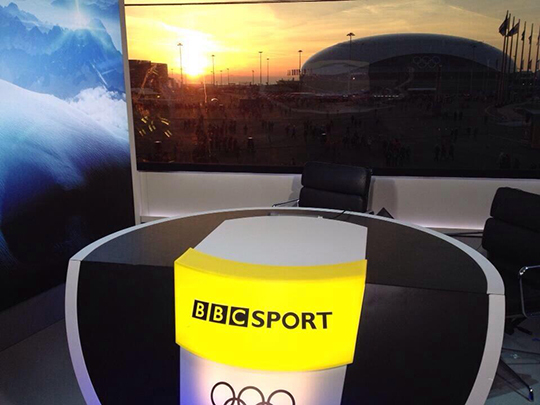 BBC brought a small studio to Sochi, with a view of the main Olympic stadium. 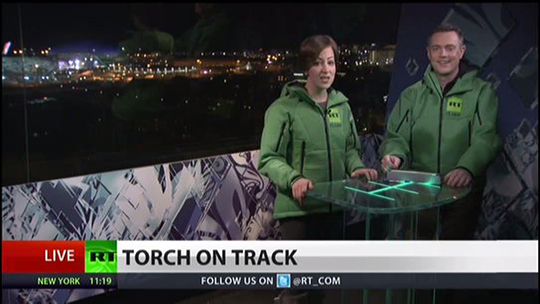 Russian broadcaster RT sprung for matching jackets but not chairs for its studio in Sochi. Stay with NewscastStudio for complete coverage with more to come.